Finding your perfect match can be an extremely difficult task. With the hustle and bustle of modern life, it is not easy to bump into someone who will respect, cherish, and love you – while understanding all your quirks. Luckily, online dating is not a taboo anymore and the experienced people behind Match found a way to help virtually everyone find their significant other. Read this elaborate Match review and learn how to become one of the many thousands of satisfied users that found love on this popular dating site. The site looks cool with an inviting appeal to it. The sign-up process guides you seamlessly through about twenty questions, which may seem a large number, but the entire procedure is extremely easy and requires little to no effort. Except for the general sign-up questions (name, email, country, zip code, interested in), there is an interesting set of questions about both yourself and the kind of partner you are looking for. This information is crucial for finding you matches that suit your appearance and personality preferences. You can also sign up with your Facebook account. Join Match and Find the Right Person For You! After you have finished, you get to browse through your matches almost instantly and the real search can begin. An interesting thing that immediately catches your eye is the organization of live events in which single people can meet, chat, and take part in different exciting activities – Match helps you socialize in both the real and virtual world. You can instantly notice how well-organized and neat Match is – all the main features are prominent and easily accessible, so even people who are not so computer-savvy should have no trouble navigating the site. Finding what you need on the site is not difficult at all, as everything is so simple and cleverly laid out. The blue and white site design is pleasant to the eye. As already mentioned in this Match review, as soon as you finish the initial registration process, you get to see your potential matches and who is online. The site shows no signs of lagging or being sluggish and you can dive into the pool of online dating in just a couple of clicks. Of course, the mobile app is also available for both Android and iOS, so you can also search for your significant other while you are on the move. One of the genuinely great things about Match is that it gives its users the opportunity to open themselves up right away by clicking on or writing about things they enjoy, thus giving their potential soulmates a chance to get to know them better. You can upload from 1 to 26 pictures to your profile, as well as your chosen preferences regarding the person that interests you. Bear in mind that you should upload your own photo; otherwise, it will not be approved as Match does everything possible to rule out potentially fake profiles. Without a profile picture, you are virtually invisible to your potential matches. There are many features you can access with a free account, like editing your profile settings, seeing who is online, sending winks or shuffling through the photos of your potential matches that you can skip or like. However, if you want to use the full potential of this site, you should consider getting a premium subscription, which enables you to receive and send messages, see who has viewed your profile, and obtain a special email through which all communication with other members happens. You also get to perform an extensive search based on an extremely elaborate set of criteria, such as smart search (based on interests), favorites (you like them most), daily mutual matches (with whom you share mutual attractions), and more. Other possibilities provided for premium members include selective visibility (you choose who can see your profile), highlighted profile (prominent in search results), first impressions (your profile included in the first round of matches for the people from your area), match me (being in the matches of a specific user for an additional fee), email read notification, participating in different events, and many others. With all the possibilities on this site, everyone has a chance to find his/her soulmate. 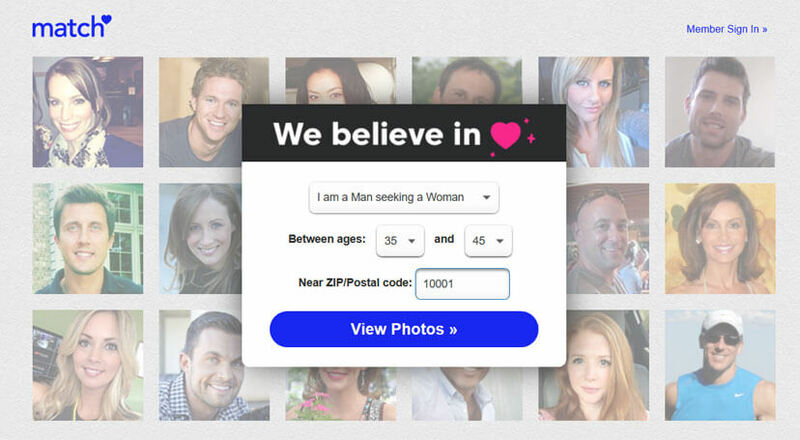 Launched back in 1995, this site is a true pioneer in the world of online dating. The people behind it create romantic opportunities for all users without bias or discrimination, welcoming all ethnicities, sexual preferences, and educational backgrounds under the site’s wing. There are over 15 million active users of all ages, which makes Match one of the most popular dating sites in the world. Women hold sway over men for a percent or two, with middle-aged people being the most common users. Bearing in mind everything stated in this Match review, we can conclude that this is one of the best dating sites in existence. It is easy to use and handle, it has a well-designed platform, and it boasts a vast member base, giving you a lot of possibilities and opportunities to find and meet your perfect match. If you are set to dip your toes into online dating, Match is the right place for you, so you should not hesitate to try it out. I will be eternally grateful to match for helping me find the love of my life. The process is not easy nor simple, but if you are patient enough, everything comes to you. I have been using Match for a year and I still have not found a soulmate, but it is not for lack of trying. I am taking my time, not wanting to rush into something that will be hard to get out of. I still believe this site will ultimately help me find what I am looking for. The site is garbage. Random matches, the app freezes out, and you can do next to nothing if you do not pay.